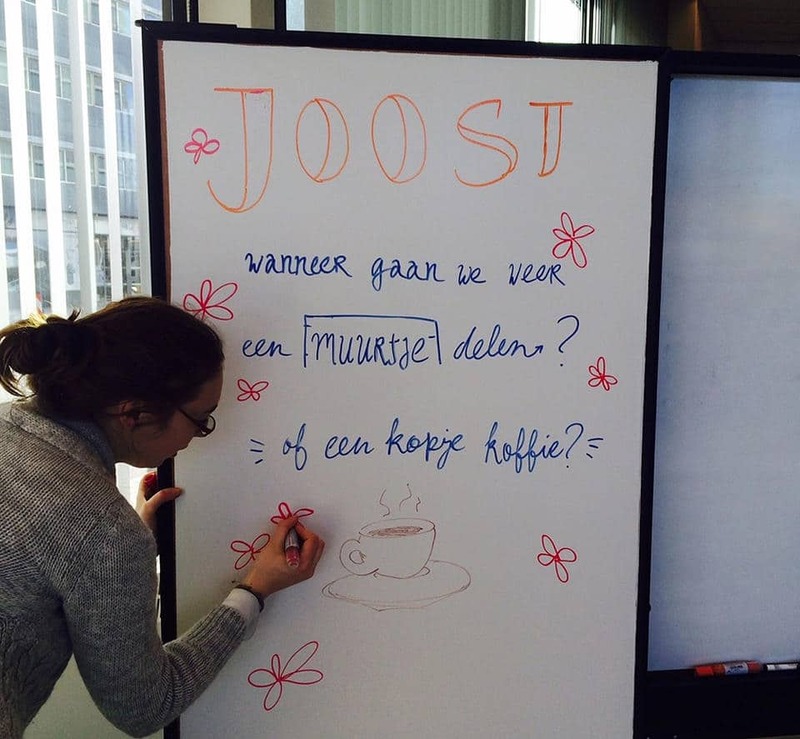 "We have put up the whiteboard wall in the coffee corner in the central hall, where many employees and visitors meet informally, have quick meetings or work on their laptops. 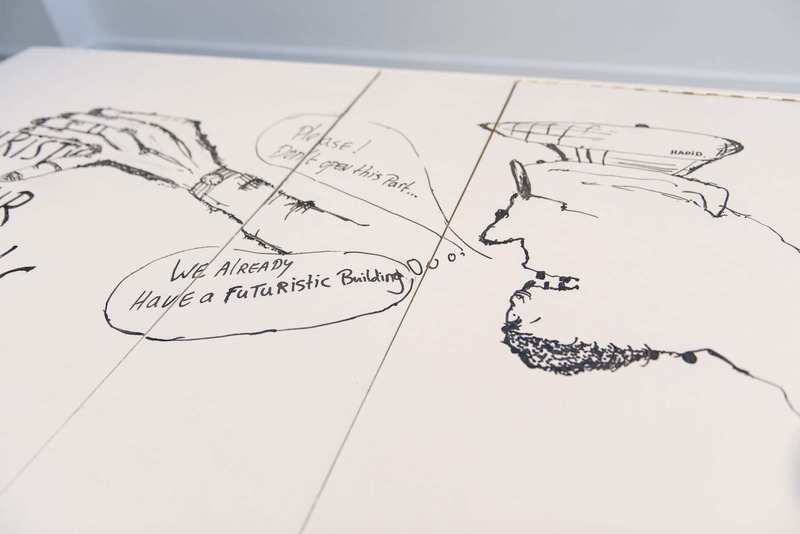 The Active Wall stimulates mutual creativity and humour. People write statements and brand names on the wall, for instance, to which everyone can respond. You'll also often see small drawings. When the wall is wiped clean, it is filled again with fun, inspiring messages in no time. 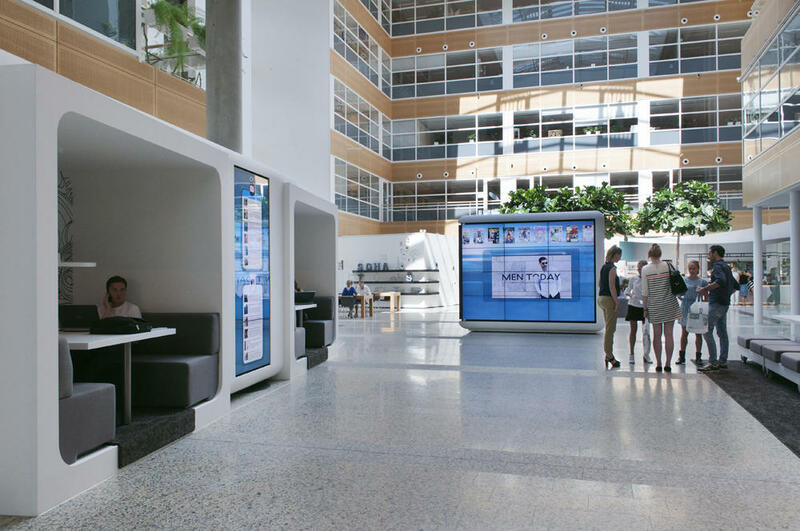 At Sanoma, the office is becoming a meeting place more and more. 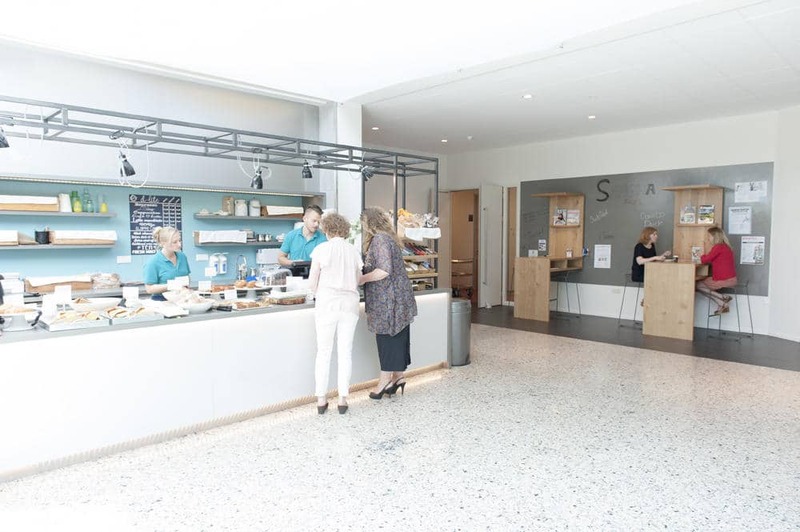 Workplaces are shared and general spaces are used for a wide variety of purposes. It is important to us to facilitate a pleasant work environment for the employees. To do so, we are looking for practical tools that stimulate creativity. Things that contribute to efficient meetings or successful brainstorming sessions. 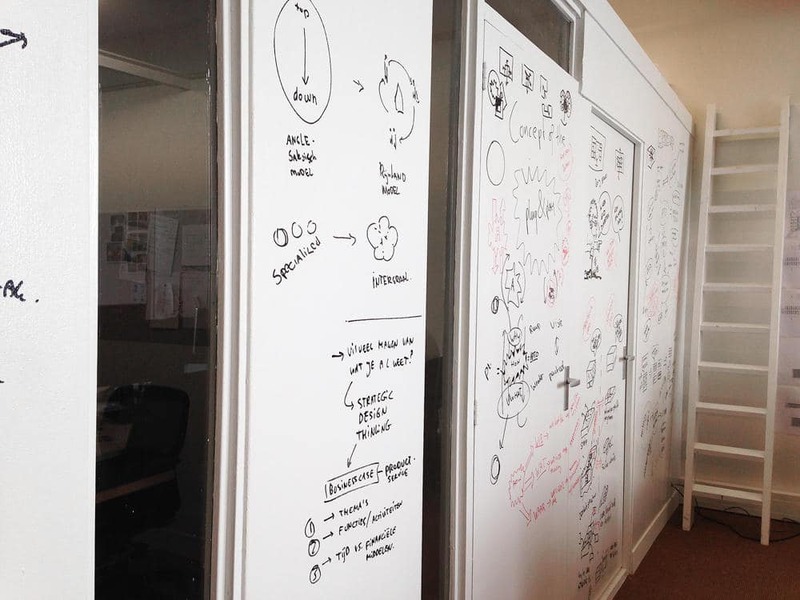 We consider the Active Wall whiteboard wall a great solution to fulfil that need." "It's my job to keep people active and break the normal work routine. I prefer to do so in the brainstorm room, our Coco room. In this Conversation Company room we are free to be creative and scrum. 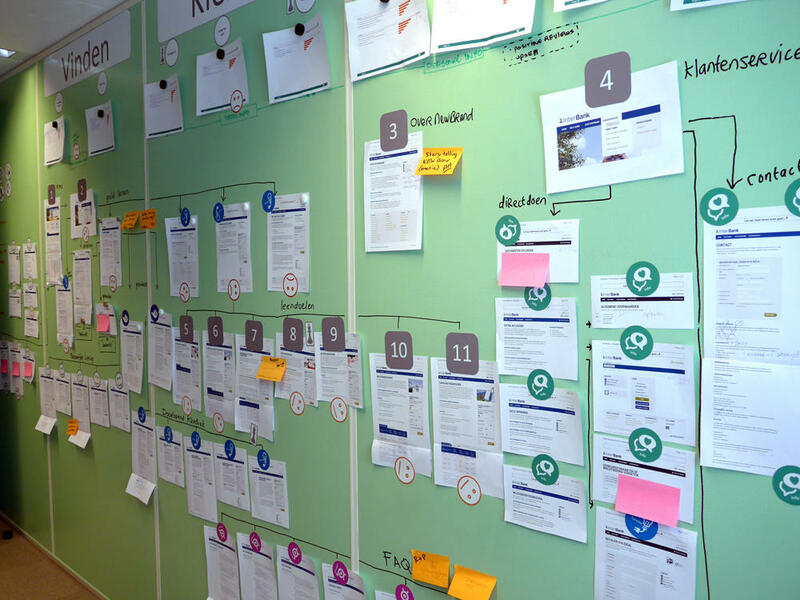 For us, the magnetic whiteboard wall is the ideal tool to depict milestones. To look back at previous weeks. To set common goals, determine team ambitions and make them concrete. 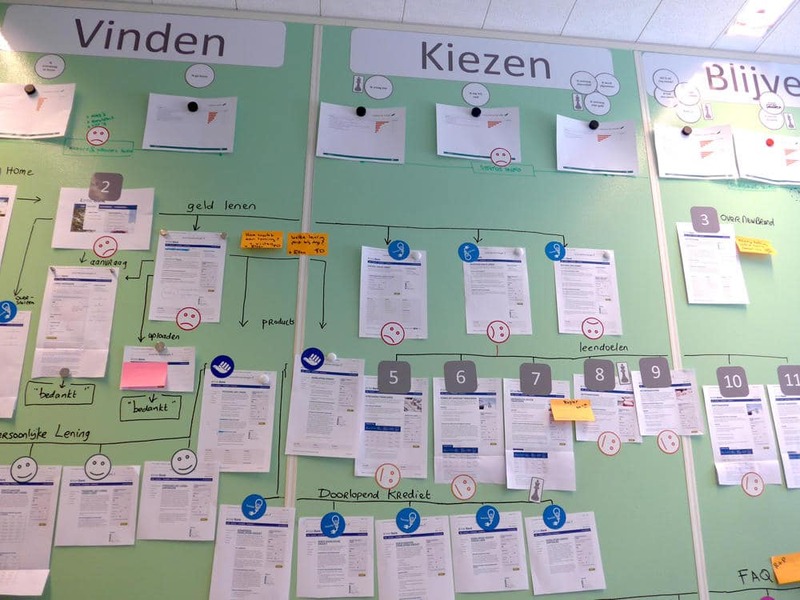 This wall helps us to make collaboration transparent and make certain matters a subject of discussion. It creates opportunities to work effectively within a group. The great thing about whiteboard paint is that you're not limited to a square but that you can use the entire space to make a game board, for instance. 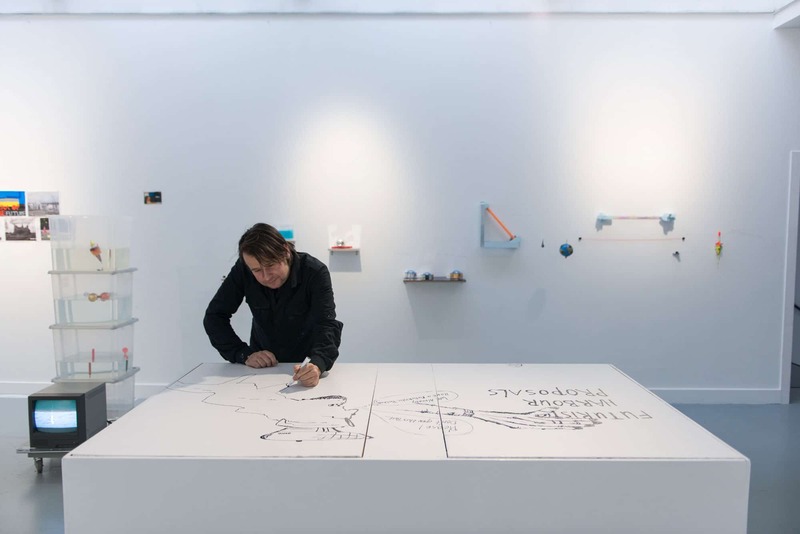 Writing and drawing on walls and tables. Where else are you allowed to do that?! It makes me happy. You break the daily routine. It helps you to come up with different ideas. It gives me pleasure to do things that you're normally not supposed to do. I notice that it creates space and freedom if you literally work outside the box. It gives us more freedom. It helps to make serious matters fun." "The recent changes that originate, amongst other things, from the crisis and the development of social media, force companies to attract customers in new ways. Therefore, the customer has to take centre stage. And you'll have to know who your customers are, and what needs and questions they have. The magnetic whiteboard wall helps to provide insight into these matters. I was very surprised that the magnetic whiteboard wall, which is basically a simple tool, works so well! I'm really enthusiastic. It helps us to start a conversation. To jointly come up with new ideas in a simple manner. 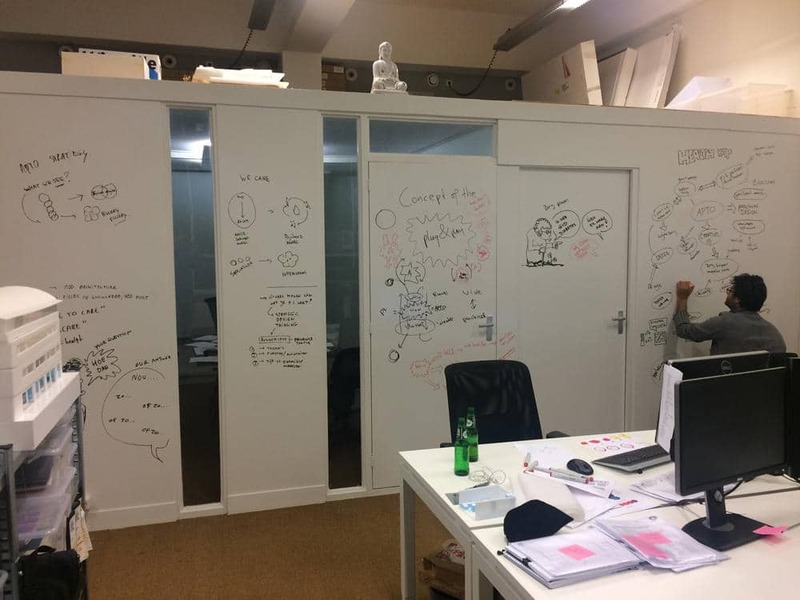 Because you are physically writing things on a large wall, meetings and scrums become dynamic and active, but the Active Wall also lends itself very well to designing our website." 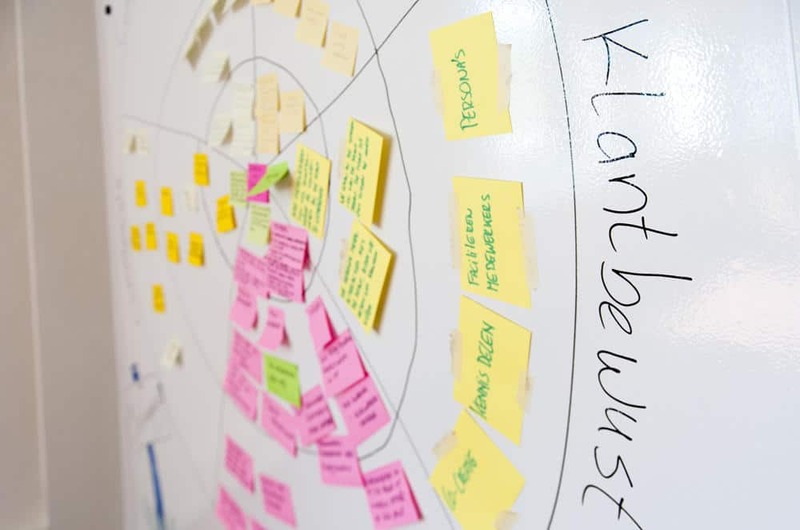 "In this age of digitization, people still have the need to splash things on a whiteboard or a piece of paper. 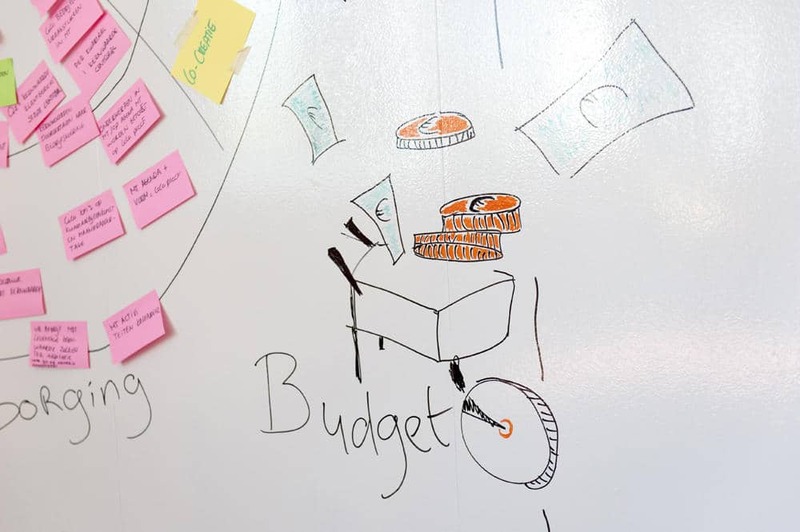 Whiteboards are usually pretty expensive and have a limited size. 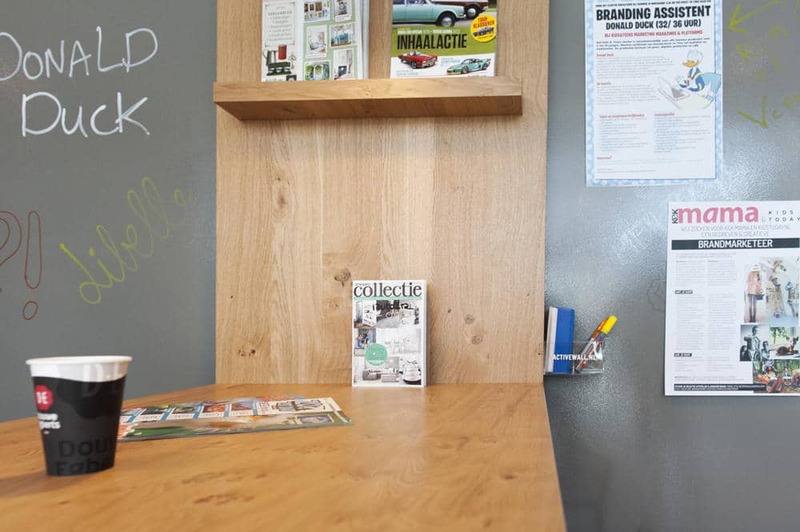 What an awesome invention this is, where you can write or present your material on an entire wall! We are really happy with it. Magnetic paint takes away the need for bulletin boards, tape or modelling clay. 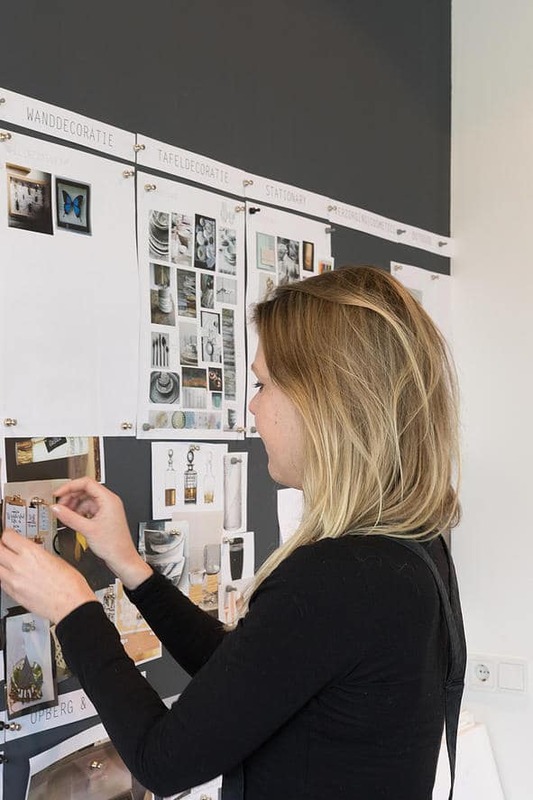 It's great that you can stick inspiring ideas up on the wall and move them about using strong magnets, without leaving any marks. 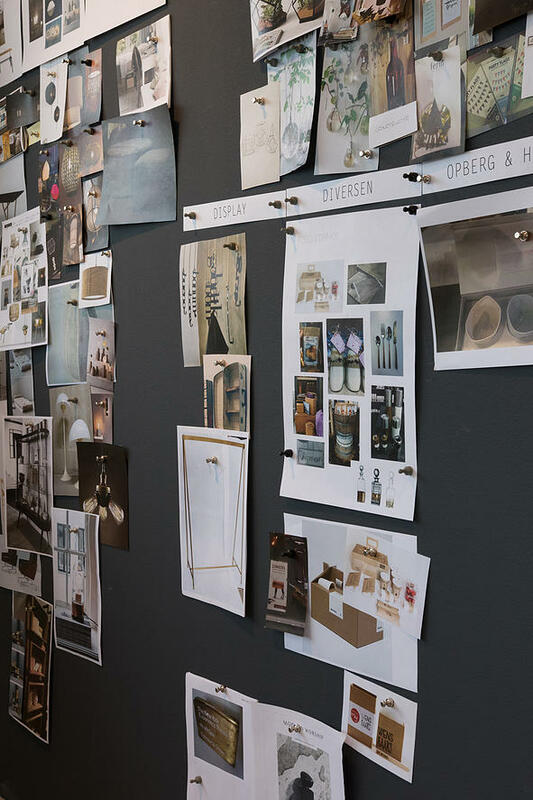 For us, the magnetic wall is the perfect tool to create our mood boards on. Combine it with the white board paint and you're set to go. You have the best of both worlds." 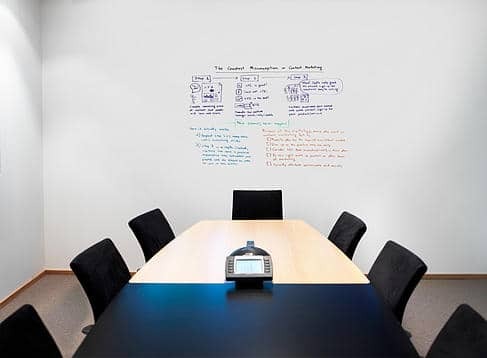 "The whiteboard wall helps us to work in a well-structured manner when we prepare presentations. 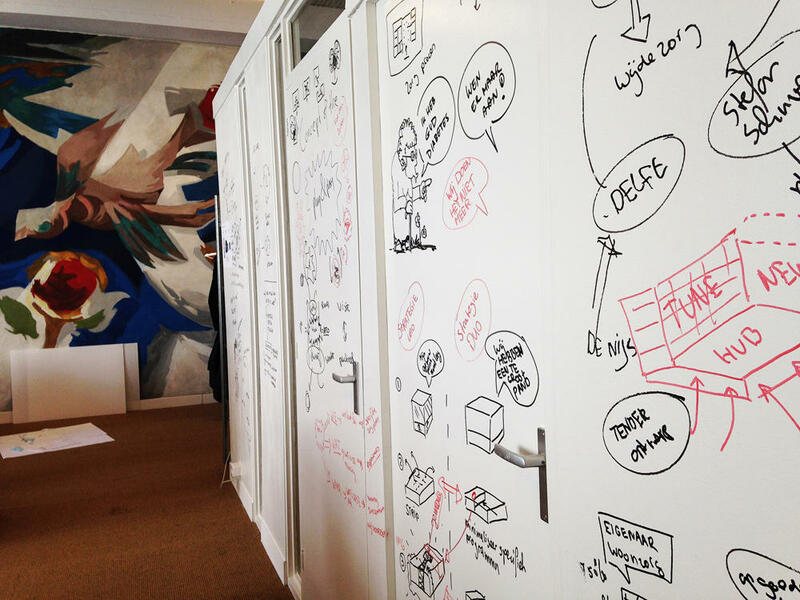 We also use the wall to brainstorm with our clients. It enables us to work much more efficiently: it makes clear, for example, what chances there are and which acquisition opportunities we can use. 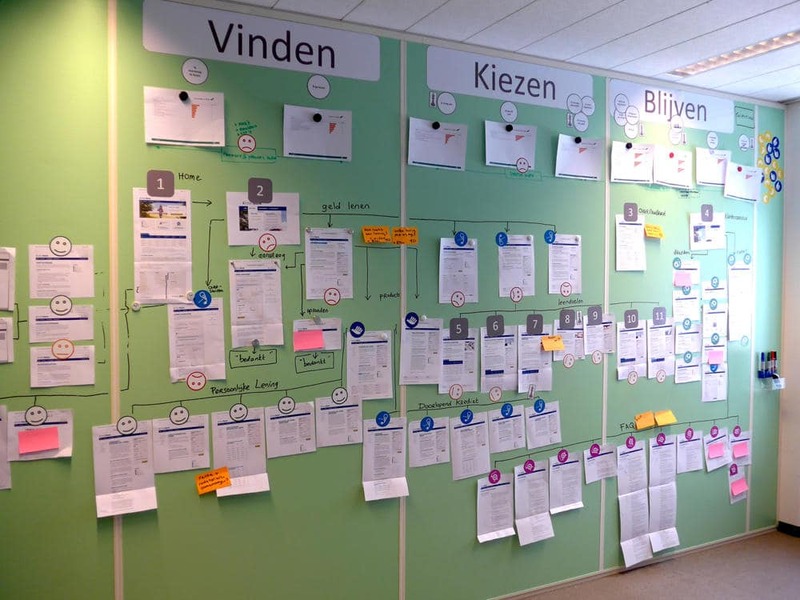 We see that the whiteboard wall also has added value for our customers who use The New Way of Working. Employees are often on the road or are working from home. So when they are together, they like to discuss the process with the team in an informal setting. Preferably next to the coffee machine. That makes it the ideal spot for a wall where you can draw on. By drawing and writing you stimulate others to think along with you. And by doing so, you strengthen each other! That is good for the team and for the concepts that they develop." "We have always had a projection screen, whiteboard and flip chart in our meeting room. 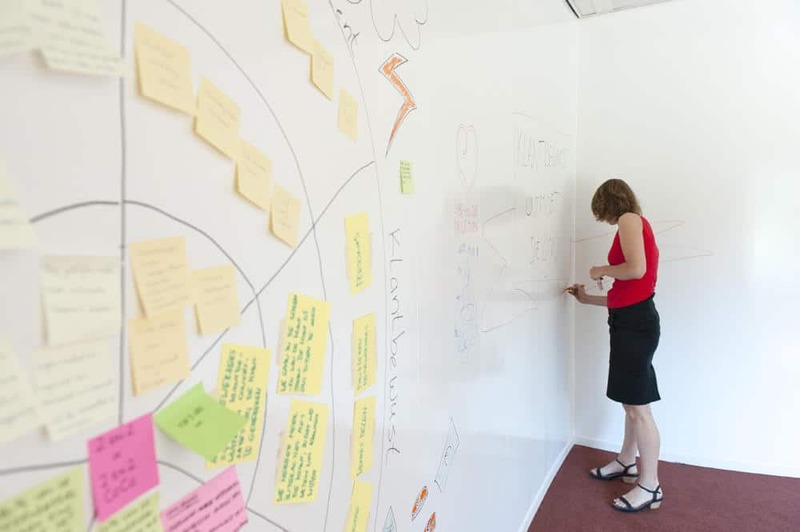 The possibilities of the magnetic whiteboard wall are endless, though. You can easily sketch out complete processes without have to stop to create new writing space. 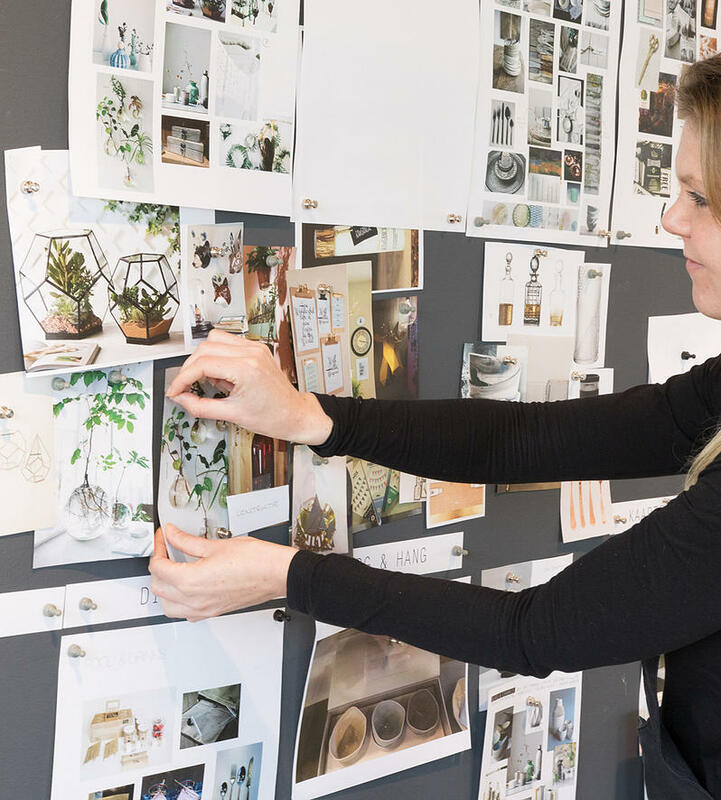 When you have to wipe out information, you'll lose part of the concepts that you have just worked out or you'll lose 'momentum' during an idea session. However, on this paint you can continue to write without stopping. 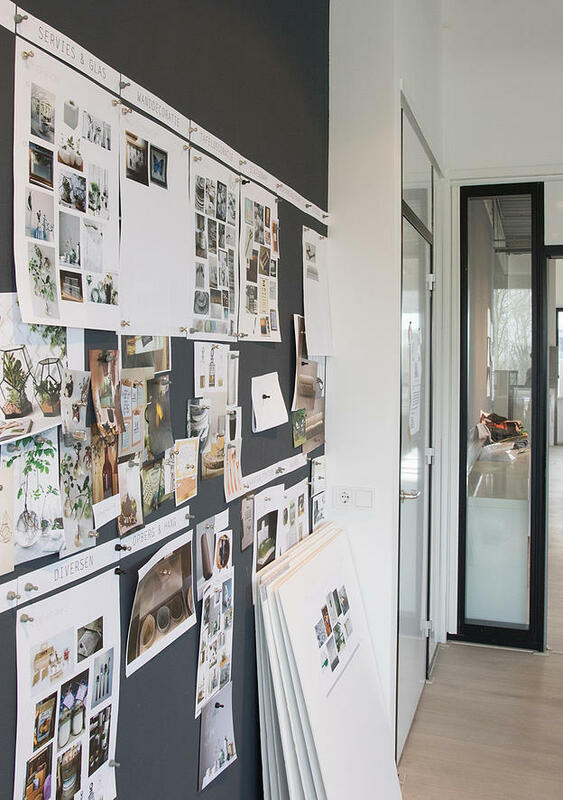 It's the ideal tool to map out and specify conceptual developments." 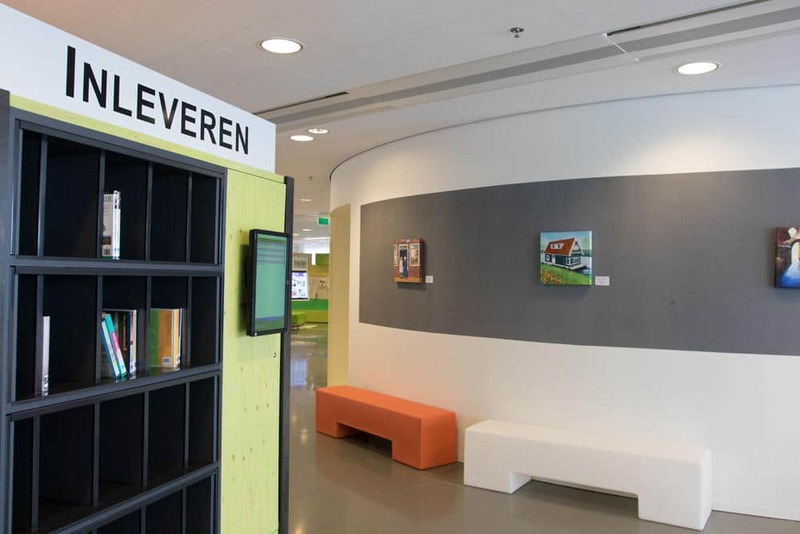 "The library of the town of Nieuwegein was relocated to the second floor of City Hall. We were asked to do the interior design for that floor. 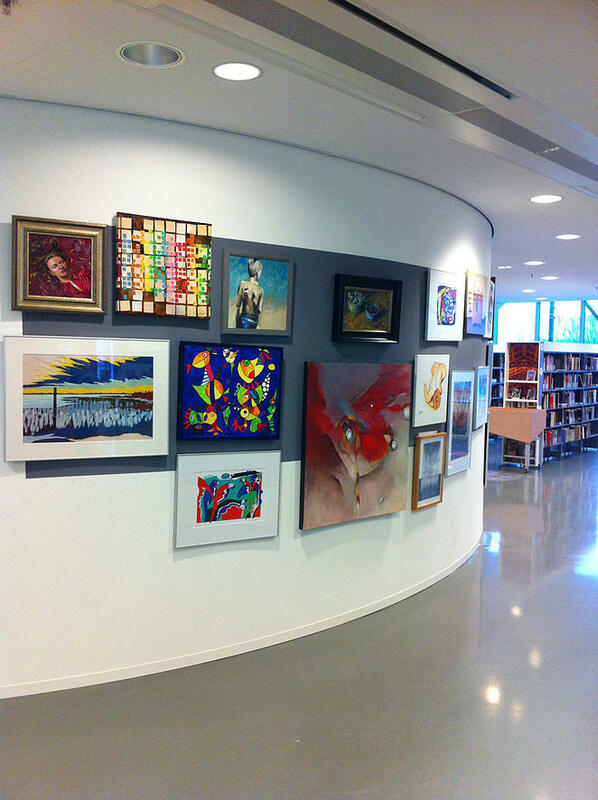 The library wanted to exhibit art, but there are few architectural walls in the open space. 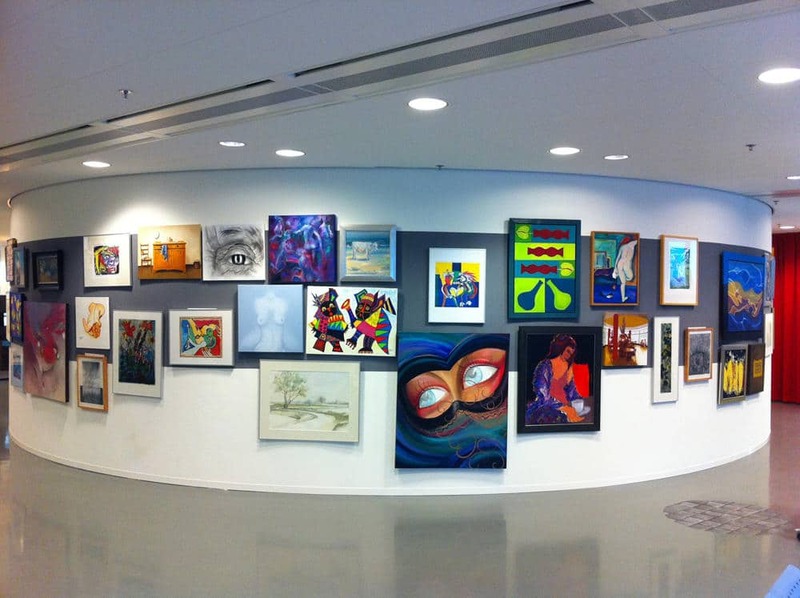 As a result, there is less wall space available to display all of the art. 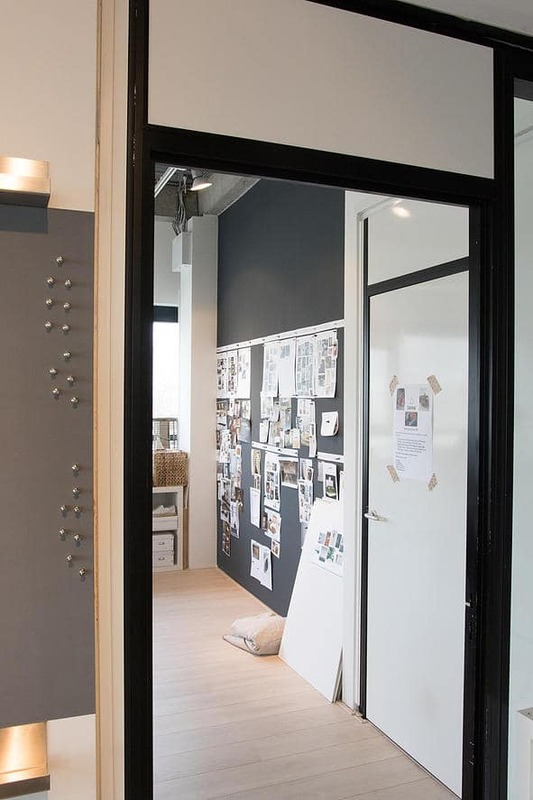 In collaboration with The Magnetic Company we found a solution: with professional magnetic paint we created a 40 square metre decorative strip on a circular wall. 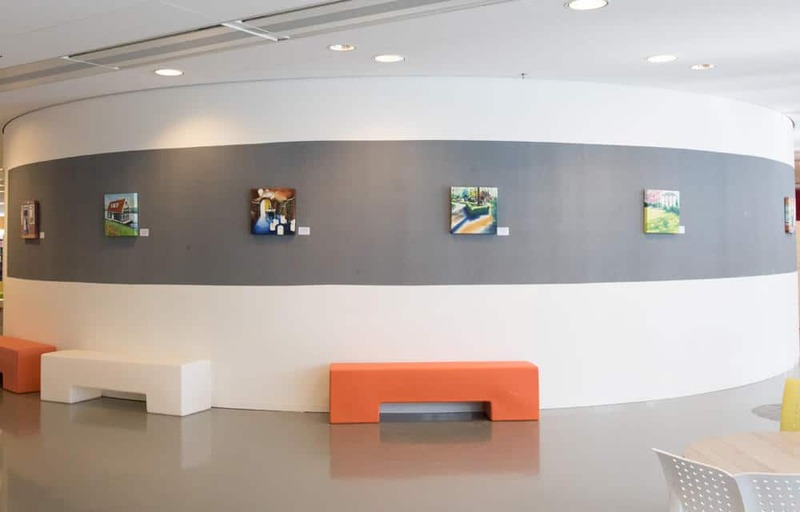 Staff can put up the artworks using magnetic hooks and simply change their position as well. The beauty of this solution is that there's no need for rails or permanent fixtures. 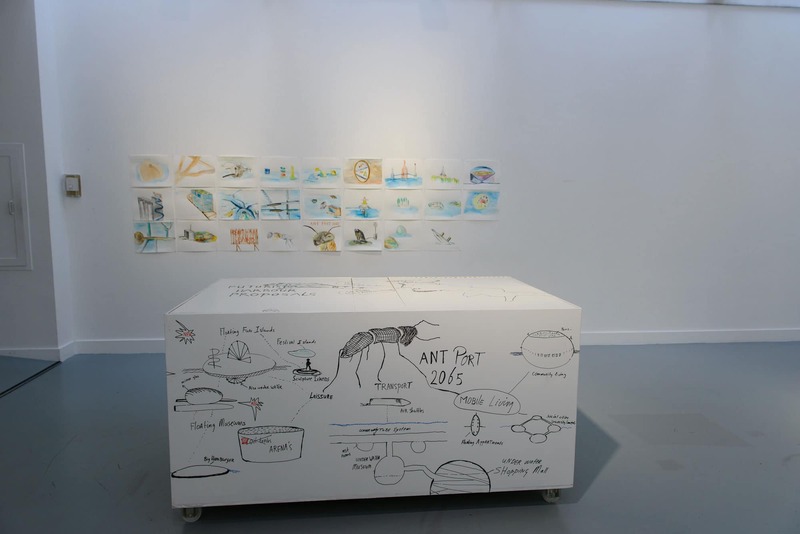 In the future, when less art will be exhibited, the magnetic wall will still remain an extremely flexible solution. 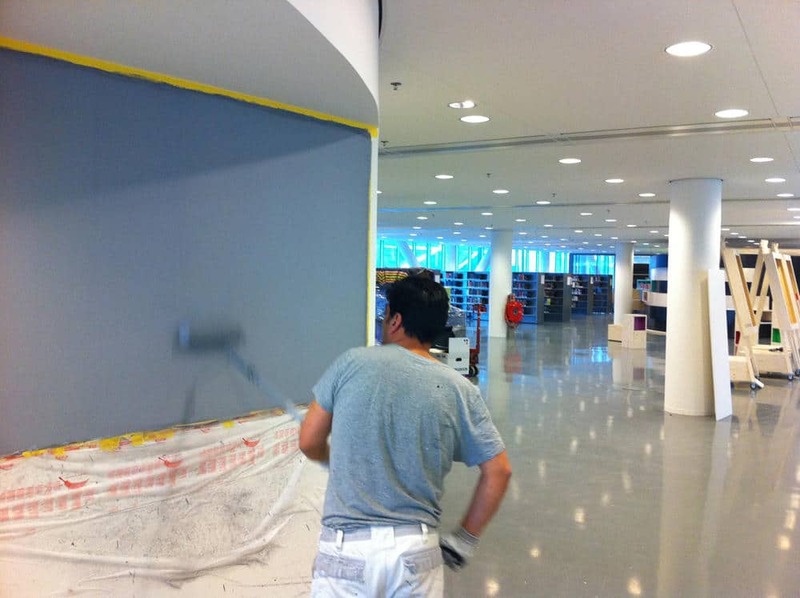 After all, the magnetic paint is also suitable for facilitating other presentation options. 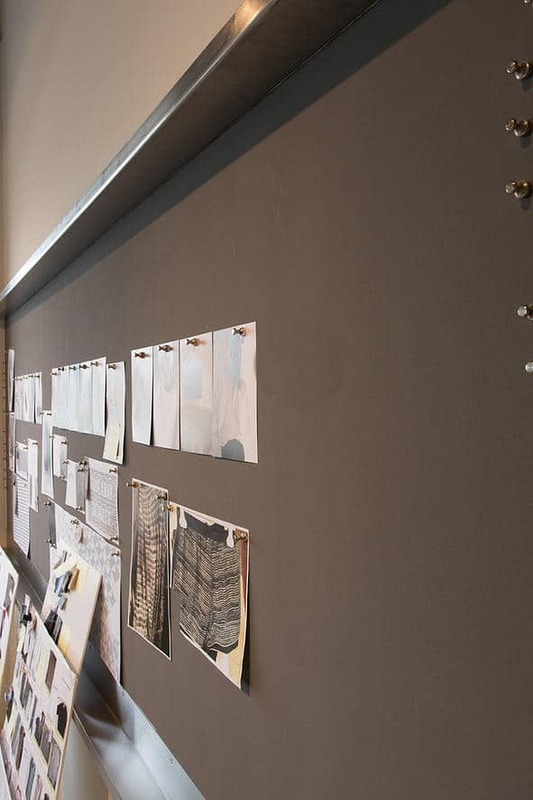 This magnetic wall fits in well with the spatial and digital concept. Thanks to the new information provision, this library is currently seen as the most modern of its kind in the Netherlands." 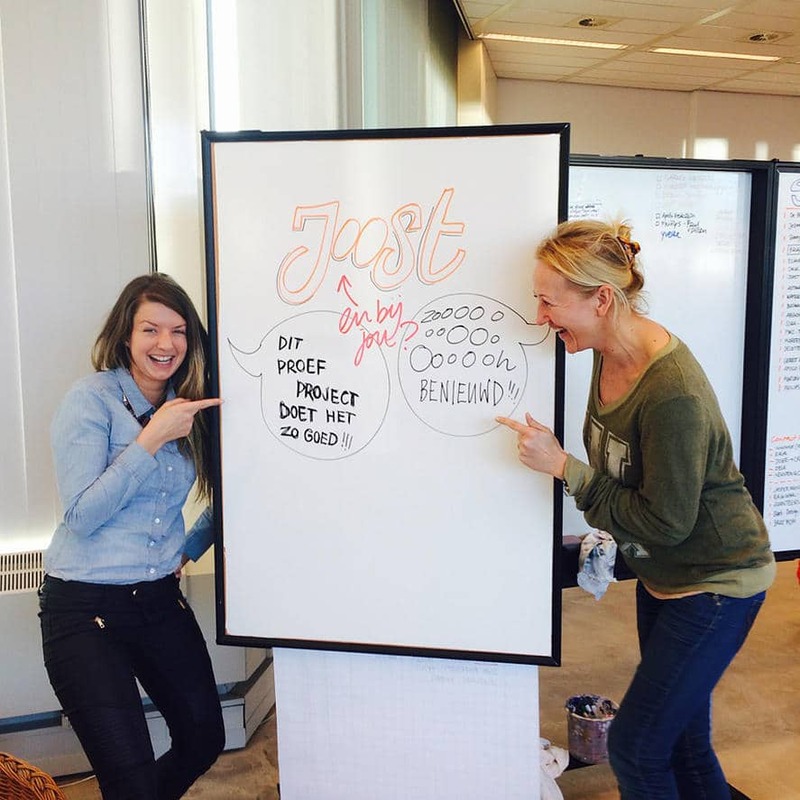 As an agency for visual communication we regularly give workshops on Business Drawing. In those sessions, we teach you how you can use drawings in a business setting. 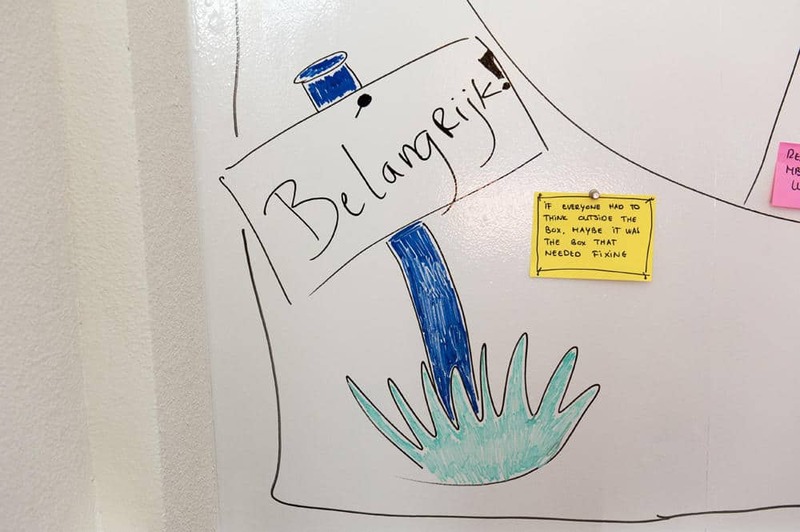 When you use drawings in communicating with your team or customers, you filter their needs. Hidden associations are made visible. That can be very valuable. For us, the magnetic whiteboard is a real winner! Drawn pictures have so much more meaning than written words. That in itself is reason enough to warmly recommend Active Wall paint to everyone! 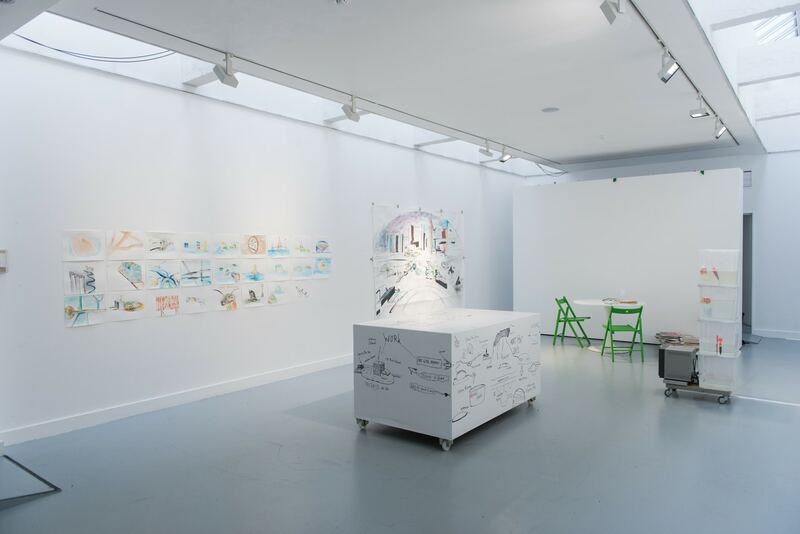 "The Muhka museum in Antwerp has asked me to contribute ideas about the future of the Port of Antwerp. In my work I'm always looking for the best materials to depict a process or investigation. 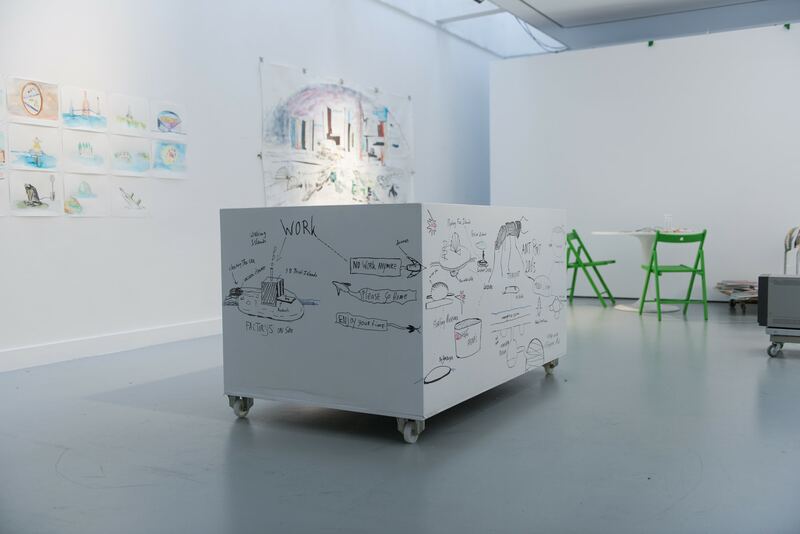 One of the ideas I came up with was to create a mobile 'whiteboard table' in the museum's exhibition space. I used it to sketch ideas for the future, with the help of visitors. During my sketching sessions I noticed that the Active Wall Whiteboard Paint attracts young people in particular. They spontaneously get to work with coloured markers to help shape the process. As a visual artist I really believe in the Active Wall products. Especially in this age of turmoil and technology (with tablets and smartphones) I think it's important that people also communicate in an analogue manner and by sketching. 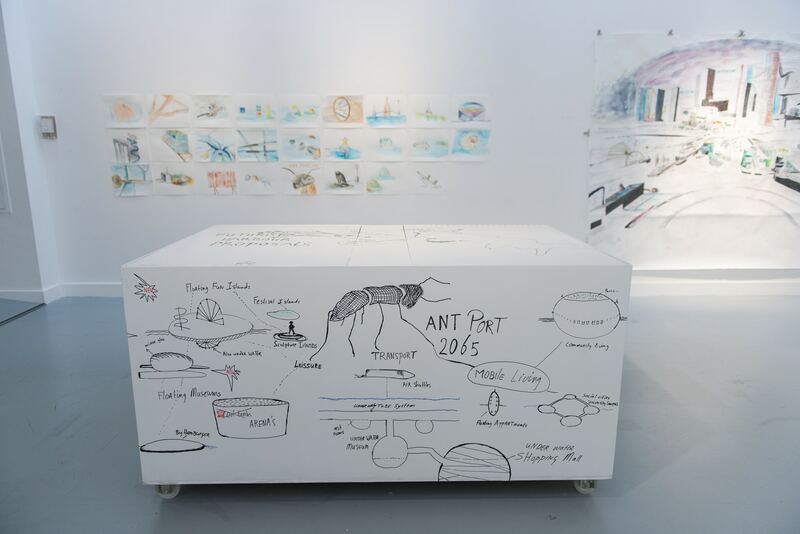 The whiteboard paint is a very creative tool to come up with new ideas and insights, either alone or with others.